Fresh corn is really best in season, which is in the summer. If it is really fresh, you can just cut it off the stem and enjoy! Your baby will love its sweet taste and get good practice with his pincer grasp attempting to pick it up. Of course, frozen corn will work for the rest of the year, and it is still delicious. Another way to serve your baby corn is by making grits. Grits are ground up form of corn that are ubiquitous in the Southern United States, and are particularly good mixed with butter or scrambled eggs (for the adults until your baby turns 1 year old). 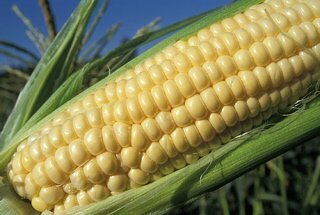 Buy fresh corn in season, or buy frozen corn kernels. The best way to tell if the corn is any good is to peel it and look at the kernels. Stores don't want you to do this - so just peek at the kernels you can see. They should be light in color and tightly packed. Fresh corn can be prepared in the microwave still in its husks. Alternatively, you can shuck the corn (remove husks and silk) and steam on the stove or in the microwave. Pull back husks from corn, leaving husks attached at base of cob; remove silks. Rinse corn and pat dry. Pull husks up over corn. Rinse corn in husks. Place in microwave and cook for 8 minutes. Test to see if heated through. If corn is hot it is done. Shuck corn and place in microwave safe dish with a few tablespoons of water. Microwave for 5 minutes and test if corn is hot. Shuck corn and remove silk. Place corn in pot with 2 inches of water. Cover and cook over high heat until corn is hot. Corn will keep in the refrigerator for a long time if it has its husk. It will lose its sweetness over time so try to use it within a week. Yes, you will see it mixed with other foods. No. It was found by the USDA to contain very little pesticide residue. See cooking methods for baby and eat plain or try corn and black bean salad below. Drain black beans well and add corn into a medium sized bowl. Dice avocados and add to mixture. Cut lime in half and squeeze on top of avocados. Add onion and mix well. Refrigerate until ready to eat.